A long-awaited comeback of the mid-size Ranger to the US has been confirmed alongside with the Bronco SUV. Spy photographers has also caught Ranger’s prototype while testing disguised in wavy dots camo. Ford hasn’t revealed details about the upcoming Ranger but we know that new-generation model will boast all-new engines, revised platform and the newest driver aids. However, Ford also promised several performance models by 2020 model year but wasn’t specific about what models would get high performing versions. According to the latest industry speculations, among the performance lineup the blue oval brand might offer the 2019 Ford Ranger Raptor. Ford hasn’t commented on this rumor so we should look on this with the dose of skepticism. However, we would not be surprised if Ford parks the new Ranger Raptor next to the full-size Raptor model. When it comes to the design of the 2019 Ford Ranger Raptor we can only make some assumptions. This model hasn’t yet been confirmed and Ford is also reserved with details about the regular Ranger version. 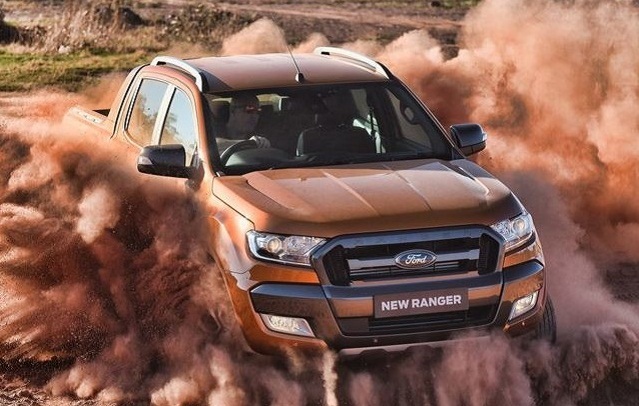 However, what we can say for sure, if the Ranger Raptor hits the off-road trails, it will ride on Ranger’s global T6 platform which redeveloped version will be the foundation for the new-gen Ranger. Of, course, Ranger Raptor’s underpinning would undergo some additional upgrading as it is the case with F-150 Raptor and its platform. In the same manner, like the F-150 Raptor version, the Ranger Raptor would look more capable than the conventional version. The new-gen Ranger should not stray far from the exterior design of the current global Ranger but to that Raptor version would add some additional upgrades. The model would get unique grille design, larger fender flares and bumpers and larger wheels with the all-terrain tires. A greater ground clearance and beefed suspension would also be the case for the potential Ranger Raptor. Like the bigger performance brother, the F-150 Raptor, the Ranger Raptor could adopt the Fox Racing Shocks and upgraded four-wheel drive combined with the Terrain Management System. If the Ranger Raptor arrives, we should expect it in the crew cab version only. We can’t tell much about model’s interior either as Ford hasn’t also revealed what it has in plans for the regular version. If we follow the analogy with the full-size Raptor and regular F-150, the mid-size Raptor would get unique trim with contrasting accents, appropriate logos, special seats and most of the advanced technologies like the regular versions. It would also offer additional options for further customization. We still don’t know what engines will Ford choose for the regular Ranger and we are, of course, far from knowing what power option would get the 2019 Ford Ranger Raptor if it comes. However, Ford upgraded the 2.7-liter V-6 EcoBoost engine for the refreshed F-150 and this engine comes paired with the new 10-speed automatic. It can produce 325 hp and torque of 375 lb-ft. A further upgraded version of this engine seems as the natural solution for the Ranger Raptor. But Ford might also raise the stake and put some version of the 3.5-liter turbocharged V-6 under the hood of the mid-size Raptor. In the regular F-150, this engine produces 385 hp while the Raptor has 450 ponies coupled under the hood. In any case, anything above 350 hp should be more than enough for Ford’s new Raptor version. The new US version of the Ranger will debut sometime in 2018. If Ford makes the decision to offer the 2019 Ford Ranger Raptor, in the best-case scenario we should expect this model in early 2019. The price is also the matter of speculation. If we consider that new Ranger should start below $25, 000 and the full-size Raptor comes for around $50k, the off-road focused Ranger could approach $40k.